Tool Selection Need not be Complicated. 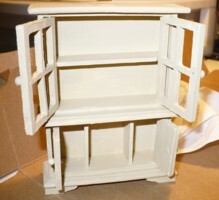 In the making of your miniature furniture parts I recommend that you obtain a group of standard tools and supplies you can use in the general construction of your furnishings. Once purchased as well all that may be required in the future is that you update your stock of tools periodically. But as you start out with this basic assortment they may be all you really need for various model making at present. Every tool listed here is highlighted in the product box below. In the "What's been Happening" section. Some construction books may list even more however. What I have listed here is for general tools needed. Though always read any pattern to see for sure if some specialty tool is required. And then ask yourself, or others if you need to, if any tool you have on hand could possibly do the job just as well. Can you improvise? You may find that you can. The tools I have listed above are a general list of what you could possibly run into in the construction of your dollhouse furniture parts. It is nowhere exhaustive by any means. Yes you could even call it your start-up list of tools. 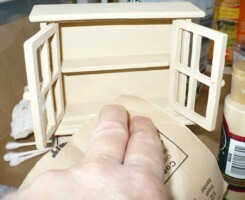 Last month I looked into terms used in tiny furniture creation. Check that issue out here. 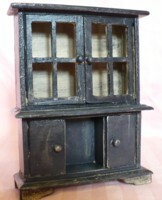 The scale of this hutch cabinet is 1:16. However, it can work in a 1:12 environments as well. 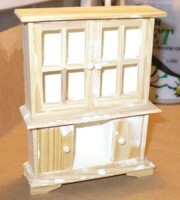 Begin your painting project by first choosing what you will paint. That may seem like an obvious first step but one that if you don't choose you really can't expect to move forward. Yes you do need to choose. And because there are so many choices, that's where some of us stall. Just like children we adults seem to freeze in the presence of abundance. Some of us are simply not good at choosing either. Ever find that, that these days there are just too many choices, period. So for some who may need it, take my lead and use my choice. Select your base color. 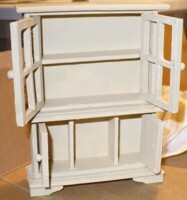 Americana Acrylic Paint - Antique White This is our main or base color choice. 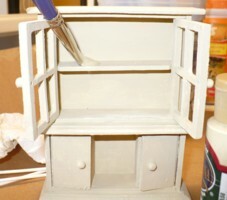 Using this color give your furniture piece two good coats of paint. 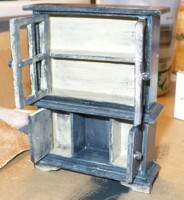 Remember to sand between each coat you apply. If you don't sand, because the pieces are so small, you may find that they stick easily where you would prefer they didn't. 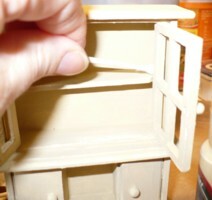 Also use a q-tip to paint in the hard to reach places such as cupboard side walls near hinges. If you desire you can add any kind of highlights. 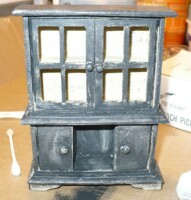 I chose to make my cupboard antiqued. So I used black DecoArt Crafters Acrylic Black as a top coat and wiped it off on small areas until I got the desired look I wanted. It has the appearance of a very well worn selection. 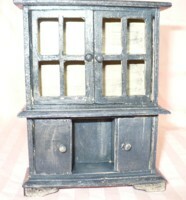 View or Buy my mini Hutch Cabinet here. My progression of steps until the hutch was completed. Hover your mouse over each picture to see what step it is. Click any picture to view and begin a mini slideshow. 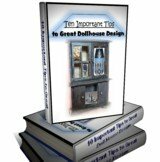 "This amazing project is the ultimate dream home for young and young-at-heart Barbie doll collectors. 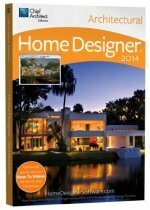 This woodworking plan will guide the woodworker through all steps of the building process. The rear of the house is open for full access to seven spacious Victorian rooms ready for decorating just as Queen Victoria may have done herself! View A Woodworking Scroll Saw Patterns and Instructions Plan to Build Your Own Victorian Barbie Project here. Get all your mini tool supplies. Antique Structure. Do you want to part with yours? Aged Styles. An antique mansion is of the rare, extremely collectible type. Do you have one? Whatever you do be absolutely positive you want to part with it, if you decide to sell. This story tells why. Prefab homes mean Quickbuild or Easy to assemble houses. Prefab homes or quickbuild are the answer when you are time or money conscious. Still don't sell them short they could be just what you want. They do let a person construct them in a day. 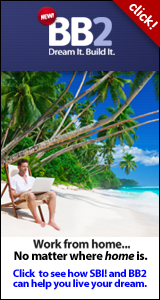 So check out our examples on this page. Woodworking Tools. Design It. Build It. Style It. Made by you. 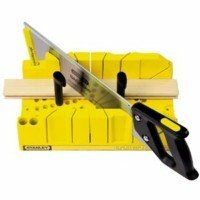 The Best Woodworking Tools will help you design, build, style and create your miniature models with confidence. Do you have all the tools you need? Check these lists to see for sure. 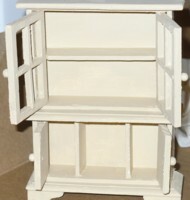 Making Doll House Furnishings is fun, creative, skilled, hands-on.... possible.... Design your own miniature pieces. 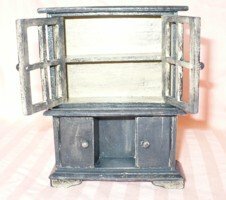 Get excited about what and how to improve your tiny interior with unique furnishings you design.